My husband doesn't normally work on Saturdays but today he is covering for one of his guys at the shop. He left early this morning with his road bike loaded on the roof of our car so he could ride Geiger Grade before clocking in. I decided to ride to south Reno to meet him for pastries and coffee. If I hadn't made that decision, I'd probably have streamed the Tour de France from the laptop to the t.v., brewed some coffee and loafed around the house all day. So I was glad I left home to enjoy the gorgeous morning weather and fresh air! 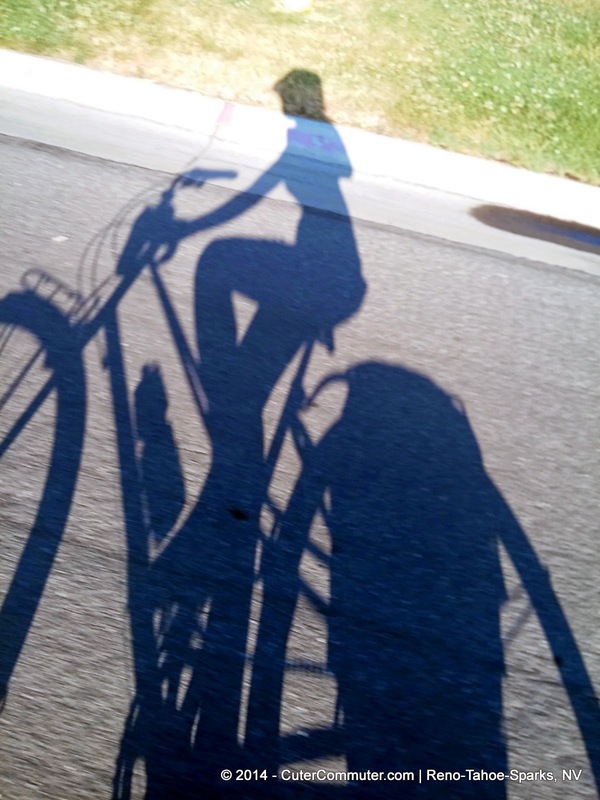 I should have ridden my road bike (which is collecting dust in the garage) but I really didn't feel like being in all those layers with a sport bra underneath my bibs and a jersey on top--especially with the weather being so humid and warming up later into the day. THEN I would have to wear cycling shoes designed to clip into my bike pedals. There are functional and performance reasons for wearing cycling specific gear but I wasn't going on a training ride today. I would also have the challenge of carrying my stuff such as a bike lock, bungee cords, my paper notebook and iPad Mini in case I decided to stop somewhere to run errands or grab a snack and respond to e-mails at a coffee bar. In this case, it was much easier to throw on a sleeveless, carefree dress and slip on comfortable sandals that I could walk in! I put all the things I may need for the day in my pannier bags and rolled out the door! 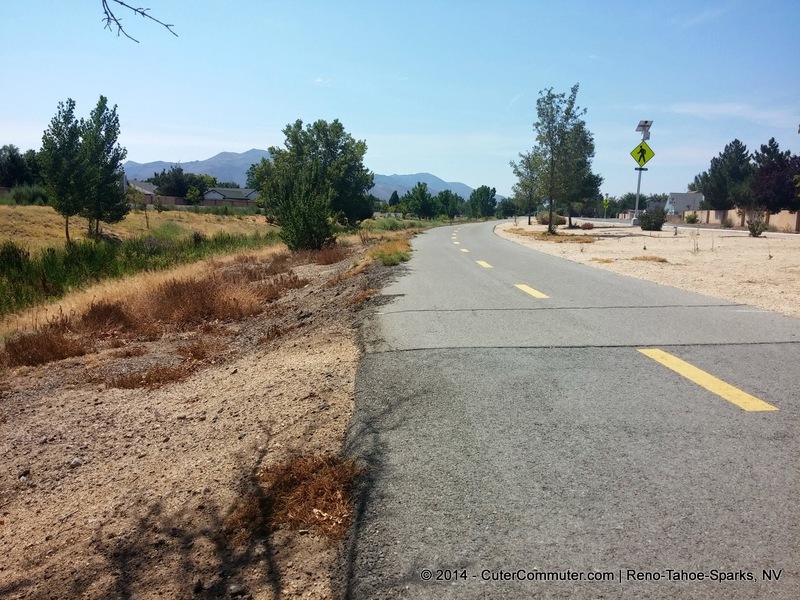 When I got to Sparks Boulevard I saw with my very own eyes what a FABULOUS job the folks at the RTC (Regional Transportation Commission) did with making the roadways pedestrian and bicycle friendly. And YES, the bicycle path at Greg Street and Sparks Boulevard is open and beautifully landscaped!! 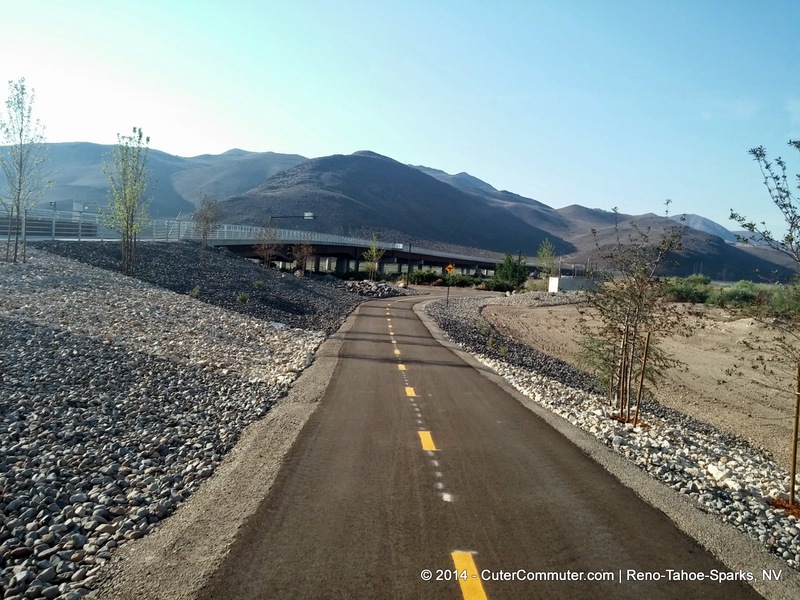 So for the folks in Reno who want to bike to Sparks for a day of shopping, dining and/or the movies -- they can easily do so and have a scenic and safe route!! So here is the plan for a day of bicycling, eating and shopping for you!! This is just what I recommend (you do at your own risk and I assume no liability for any injuries as a result for taking my recommendations here. I rode this route today and made it all the way home safely without a hitch.) You will have to forgive all my comments about crossing the crosswalk defensively. I don't mean to preach if you are already a safe bicyclist. I just don't want anyone to get hurt. Lights (front and rear are not necessary but I always have them on my bike and I always turn them on. 1. 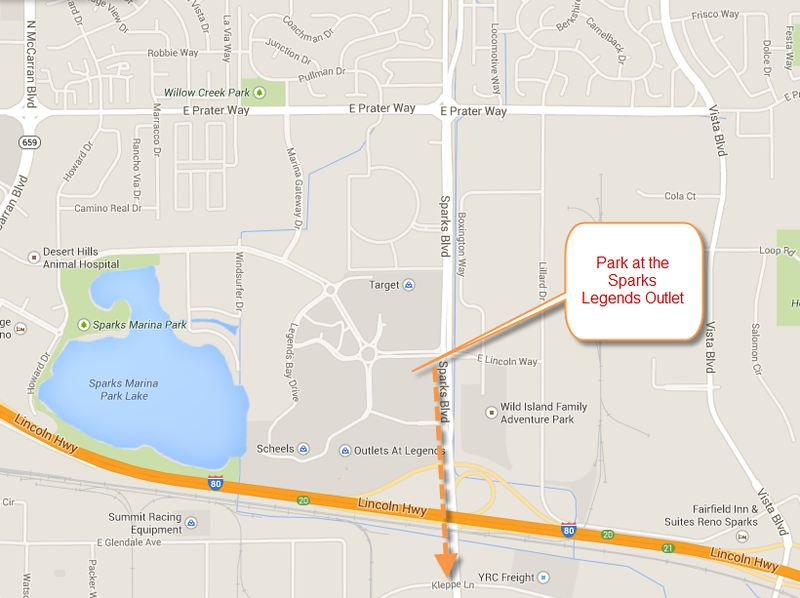 Drive out and park at the Sparks Legends Outlet (enter at the traffic light signal on E. Lincoln Way from Sparks Boulevard exit). This dirt lot is now paved. I wouldn't park much deeper into the outlet grounds because the roundabouts can be tricky to navigate on a bicycle, especially when traffic starts to pick up. to pass side by side. Just yield to pedestrians and let them know you are approaching with a greeting so they aren't startled by your sudden appearance. 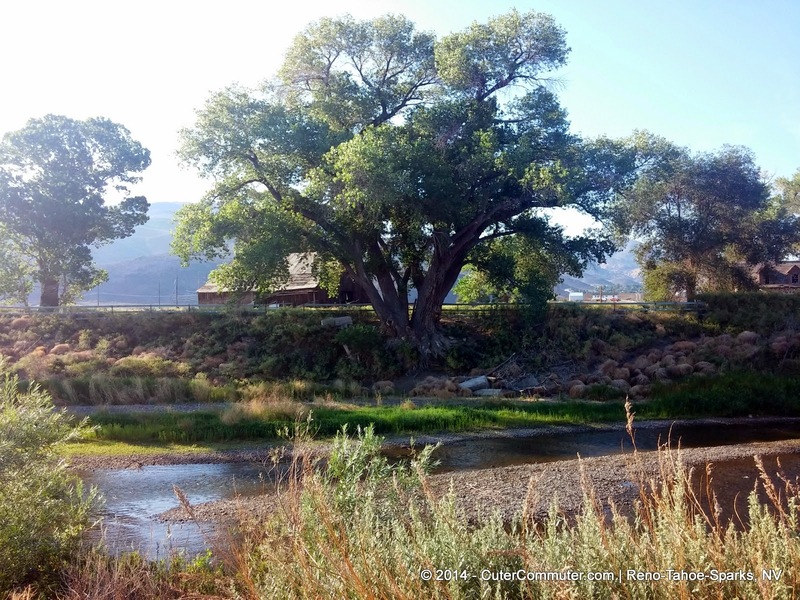 Basically you will stay on the west side of Sparks Boulevard the entire time to the Truckee River Trail and you will stay on the west side on your way back, taking the same route. 3. At each intersection crossing there are push buttons for crosswalk signals like the one pictured below to let you know when to proceed across the intersection. Use the devices and cross when the signal indicates it is your turn to go. Please look in all directions for approaching vehicles on Sparks Boulevard getting on and off the I-80 on ramp and cross when it is clear and safe for you to do so. Right of way does not guarantee safety or that people driving actually see you!! Even though you are a crosswalk it DOES NOT mean those driving will stop so cross only when you think you have time to clear the road safely. 4. 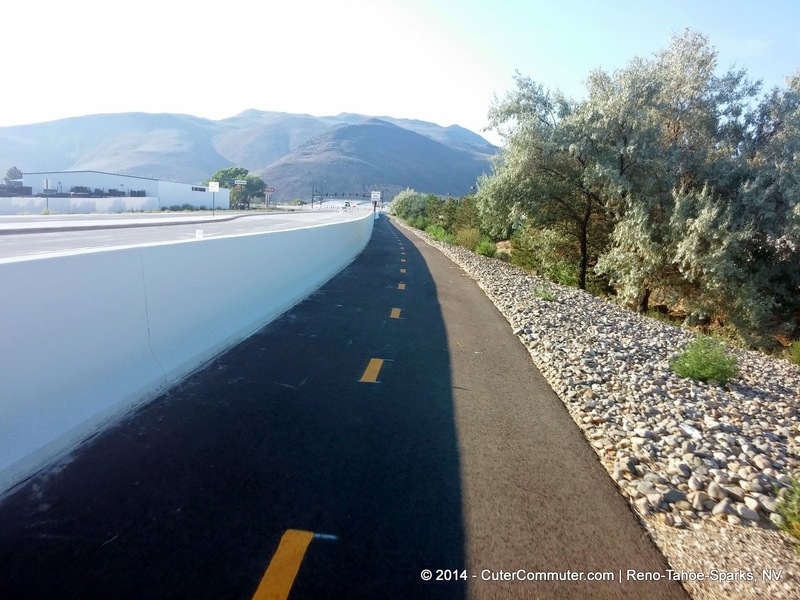 The entire way to the Truckee River Bicycle/Pedestrian path is protected by concrete barriers from passing traffic as the photos below show. Again, the only place you need to use extra caution is at the road crossings, especially at the I-80 on-ramp and off-ramp and the Sparks Boulevard merge lane to Greg Street. Just because the crosswalk sign in on and you are at a crosswalk does not mean the drivers will stop (90% of the time they don't.) I have noticed that visibility and the line of sight for both people driving cars or using the crosswalk is nice and clear which is a good thing from a safety perspective. And there are protected islands for you to cross and stop at so you aren't stuck in the middle of road when the traffic lights change. 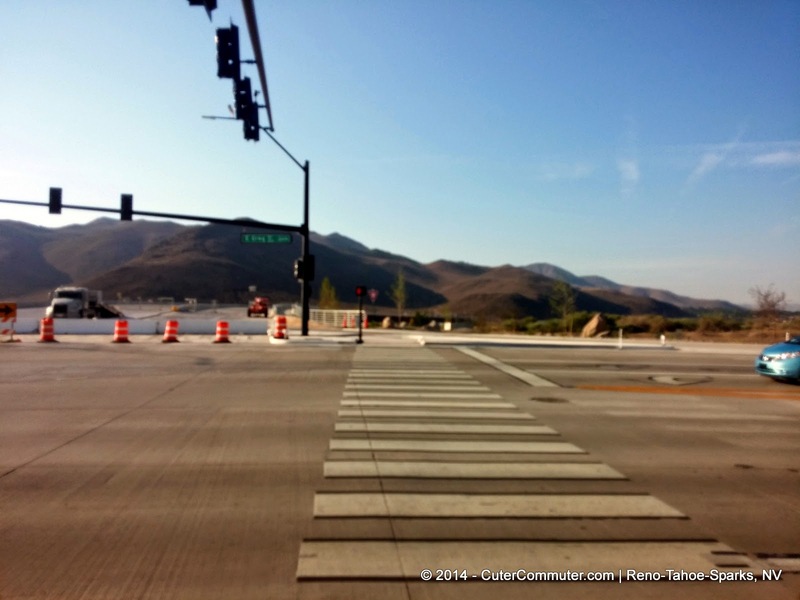 Again, I have to give massive kudos to the RTC for these pedestrian and safety improvements!! 5. Finally you will cross Greg Street. 6. And you will be right on the path! 7. 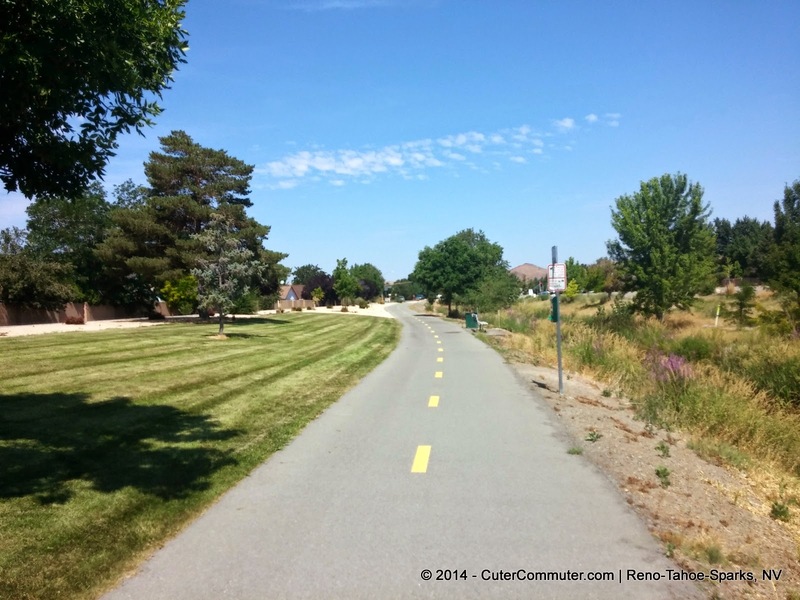 Turn right once you are on the Truckee River Trail and head west towards Reno. The path also goes underneath the Southeast Connector (under construction) and east to the commercial streets near Vista Boulevard. View of path from Greg Street and the path underneath the Southeast Connector towards Vista Boulevard. 8. It is smooth sailing from here although it is still necessary to look and listen. Ride your bike towards the right side of the path and watch for other people walking, running or biking. Use the bell on your bike or your voice to let them know you are approaching because they may not see or hear you and change direction at the last second. I usually call out a 'good morning' or 'hello' to greet them and give them a heads up at the same time!! Ride as far as you want and are comfortable with doing. 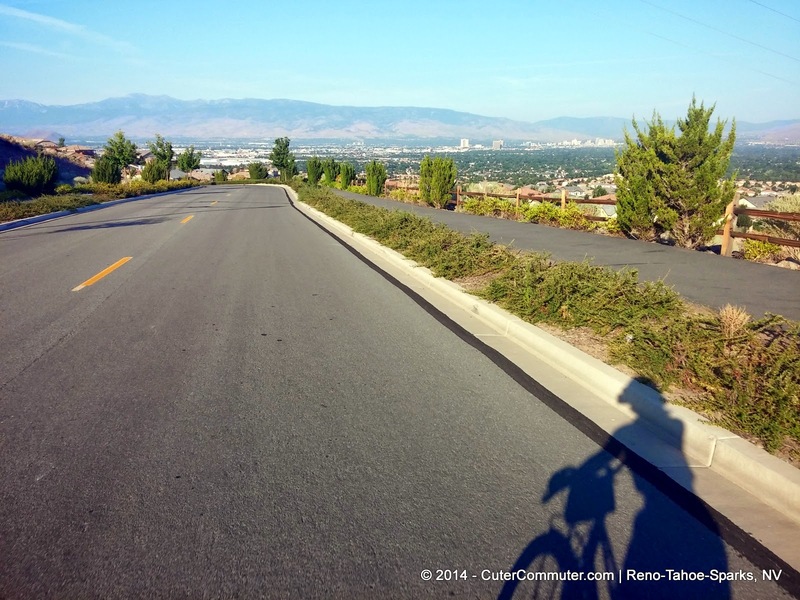 The path will take you to the National Automobile Museum and downtown Reno. 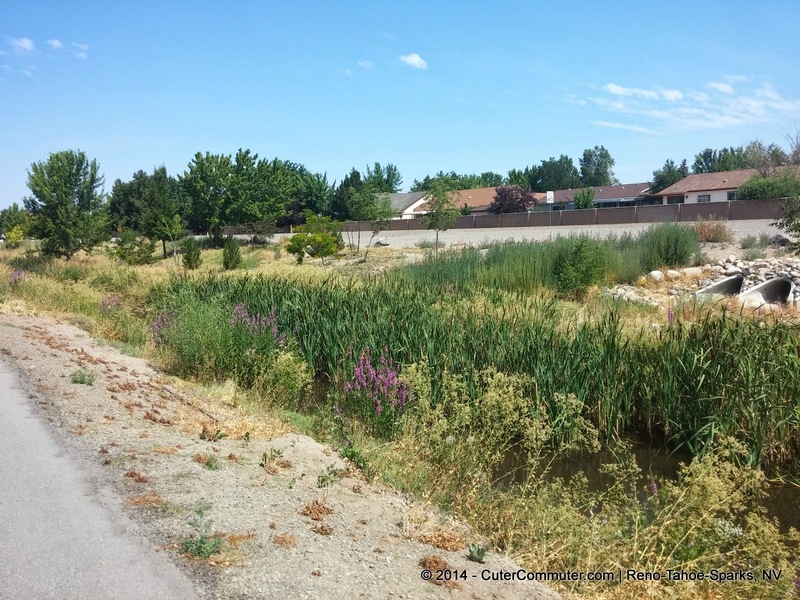 If you continue through, the path will take you through downtown Reno to Idlewild Park and Mayberry to Verdi! 9. Again, your return trip is exactly the same route in reverse. Stay on the west side of Sparks Boulevard until you get back to where you parked. Then get some grub at the food establishments below and enjoy your shopping trip! Or watch a movie at the new luxury Galary IMAX Theatre. 10. Take your bike with you and lock it up where you can see it while you eat and shop, store it in your car or lock up your bike to the rack on your car. I'd probably move and park where there is passing foot traffic instead of leaving your bike at the car in a somewhat remote lot. Thieves are opportunists and they may not try to steal your bike if you make it hard for them and if there are people passing by frequently. 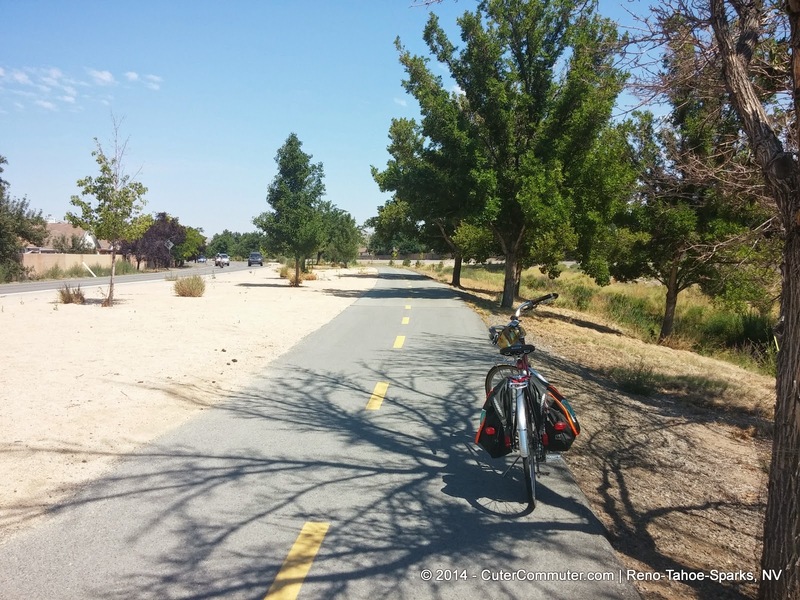 If you feel like exploring on your return trip, bypass where you parked and use the cross walk system to get on the bike path along Sparks Boulevard (see the illustration). 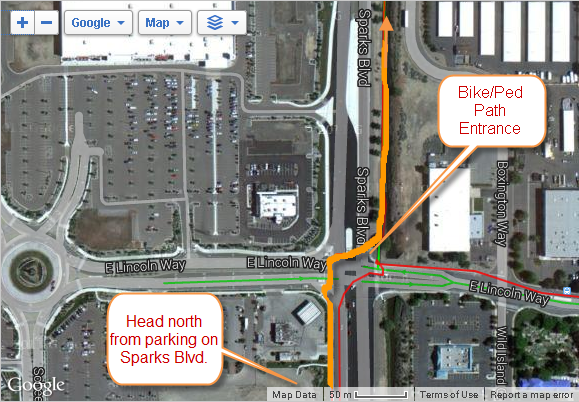 Cross Lincoln Way and then Sparks Boulevard and you can get on the separated bike/ped path on the east side of Sparks Boulevard. And ride on a separated, protected bike/ped path like this. You can ride to have breakfast at Peg's Glorified and Ham on Pyramid Way and Sparks Boulevard. Or stop and have a picnic on the grass! There is seating along the way so you can sit and enjoy the view! 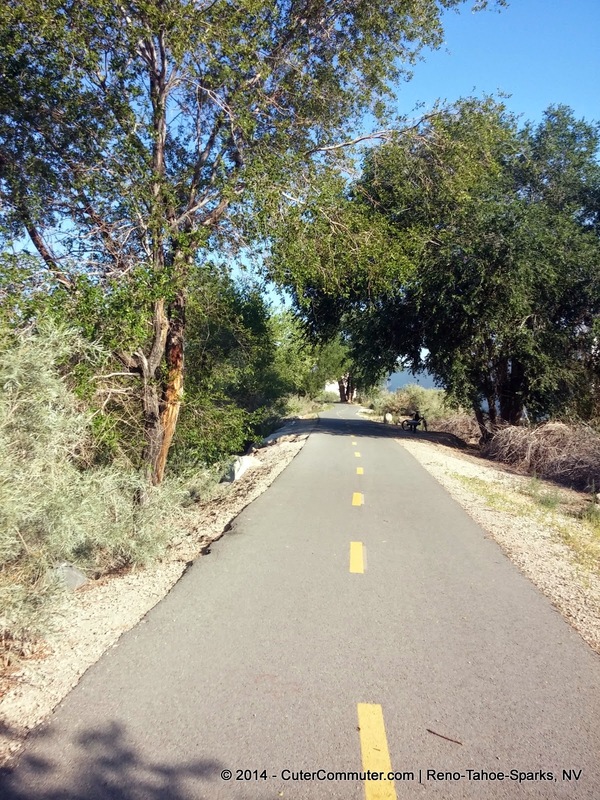 Now that there is a protected path connecting the Sparks Legends Outlet to the Truckee River Trail, it is a breeze to go on a fun bike ride and get in great physical activity, dine and then shop with the family all in one afternoon!! Or go to the Wild Island Family Adventure Park to ride the Indy Cars, play miniature golf, indoor bowling, or cool off in the water park!